Just Cause 4 Confirmed, Leaked Via Steam Ad, Because Why Not? 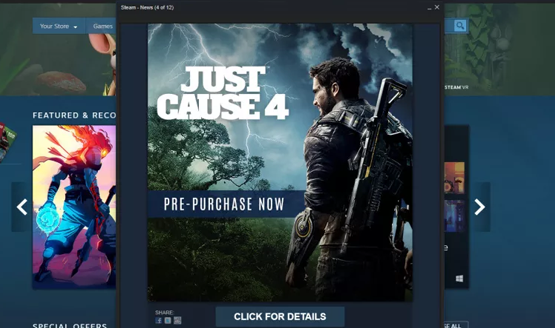 Just Cause 4 Confirmed, Leaked Via Steam Ad Because Why Not? In what will come to be known by historian as the Season of Leaks (I should get that trademarked), yet another game has seen the light of day ahead of a “surprise” E3 announcement. Just Cause 4, previously heavily rumored based on a Walmart Canada glitch, is now as good as confirmed. According to Luke Plunkett over at Kotaku, users logging into Steam were served with a giant advertisement for Just Cause 4. Plunkett himself reports seeing the ad, so this isn’t a second-hand leak from an anonymous source. It looks like somebody scheduled that advertisement a little bit early. You can see the full ad below, which features Rico Rodriguez standing in front of some lush greenery and a lightning storm. The image doesn’t tell us a lot about the setting, but the previous Just Cause games have always had a bright, sunny, and tropical theme to them. The dark rainstorm is a tonal shift for the series, but we don’t even know if the themes preset in the key art will feature prominently in the game. Now that both RAGE 2 and Just Cause 4 have been confirmed as real, it might be time to head back to that Walmart Canada leak and have a long hard look at what else we could see announced soon. Some of the leaked titles weren’t name in full on the web page but are now confirmed (Assassin’s Creed Odyssey as just Assassin’s Creed). Could we soon see the heavily rumored Splinter Cell get announced? What about the next Borderlands, even though Gearbox said it wouldn’t be at E3? Stay tuned to PlayStation LifeStyle into next week where we’ll be able to answer all of these questions and more. The Square Enix live stream begins at 10 am Pacific on Monday, June 11, and that’s the most likely place where we’ll see Just Cause 4 get officially unveiled as a huge “surprise” at E3. Well, at least it wasn’t leaked by a keychain.